Temtron specializes in Athena hot runner repair. We can repair all of your controls, mainframes, and cables. Standard repair pricing is available on Athena controllers. We offer a low price guarantee. All Athena hot runner repair and calibration tasks are performed in-house with equipment traceable to the National Institute of Standards and Technology. Temtron can build most special or custom cables to fit most needs. 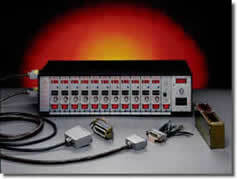 Example: Run molds equipped for INCOE using a Athena Hot Runner control system or the reverse. Tell us what YOU need! New Athena hot runner power and thermocouple cables can be very costly. Let Temtron repair your defective Athena hot runner cables at a significant savings. Athena Controls which no longer operate properly or become damaged, often need to be repaired quickly and at a reasonable price. Over the years, Temtron has developed some repair and calibration techniques that allow us to economically repair almost all modules that we receive.